Gold prices rose on Friday and the dollar retreated after Federal Reserve Chairman Jerome Powell predicted no recession in 2019 and said the U.S. central bank will be patient in determining when to hike interest rates. Fed Vice Chairman Richard Clarida also said the Fed could afford to take a wait-and-see stance on interest rates if headwinds to the economy from financial markets or global growth prove persistent. Spot gold rose 0.7 percent to $1,293.35 per ounce, on track for a fourth straight weekly gain. 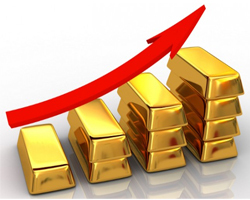 U.S. gold futures were up half a percent at $1,293.50 per ounce. The U.S. dollar slipped against other major currencies as the partial federal government shutdown entered its 21st day, raising concerns about the economy. President Donald Trump threatened on Thursday to declare an emergency so that he can bypass Congress to pay for a wall on the U.S.-Mexico border. Investors also await further progress in the Sino-U.S. trade talks.